London Mini Marathon Trials 2019 – Be Part of Team Wandsworth! 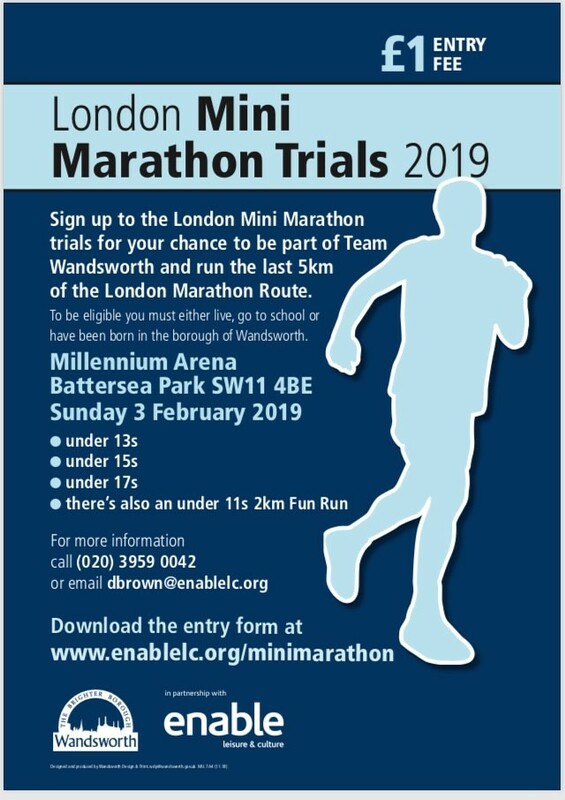 Enable Leisure and Culture are organising the Wandsworth trial event for the London Mini Marathon and will be selecting a number of Wandsworth-based runners to compete on behalf of Team Wandsworth in the Mini Marathon. The Mini Marathon takes place on 28 April 2018 (the same day as the London Marathon) and the course is the last 5k of the full marathon route. It is a really great event to be part of. The Wandsworth trial event takes place on Sunday 3rd February in Battersea Park. There will be a 5k race in different age categories for boys and girls aged under 17, as well as an under 11s fun run which is just 2k long. The event is aimed at both high performing athletes and those that just want to take part in a race. For more information, please contact 020 3959 0042 or e-mail dbrown@enablelc.org. You can download the entry form at https://enablelc.org/minimarathon. New Year's Day is a very special day in a parkrunner's calendar, as it is the only day in the year when you can run two parkruns in the same day and have them both recorded. The Tooting Common parkrun team are pleased to announce that we will be holding our first event of the year on Tuesday 1 January 2019 at the later than usual time of 10:30am. Come along and start 2019 with a trot round the Tooting Triangle. And for those extra keen parkrunners among you our neighbours at Peckham Rye will be hosting an event at 9am, so you may wish to run there and then come to Tooting Common to complete a New Year's Day double with us. We look forward to celebrating the New Year with you all! London Mini Marathon Trials 2018 – Be Part of Team Wandsworth! 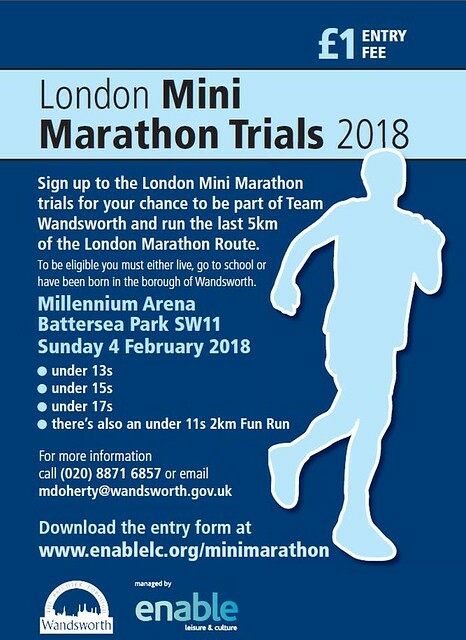 Enable Leisure and Culture are organising the Wandsworth trial event for the London Mini Marathon and will be selecting a number of Wandsworth-based runners to compete on behalf of Team Wandsworth in the Mini Marathon. The Mini Marathon takes place on 22 April 2018 (the same day as the London Marathon) and the course is the last 5k of the full marathon route. It is a really great event to be part of. The Wandsworth trial event takes place on Sunday 4th February in Battersea Park. There will be a 5k race in different age categories for boys and girls aged under 17, as well as an under 11s fun run which is just 2k long. The event is aimed at both high performing athletes and those that just want to take part in a race. For more information, please contact Matt Doherty on 020 8871 6857 or e-mail mdoherty@wandsworth.gov.uk. You can download the entry form here. The Tooting Common parkrun team are pleased to announce that we will be holding our first event of the year on Monday 1 January at the later than usual time of 10:30am. Come along and start 2018 with a trot round the Tooting Triangle. And for those extra keen parkrunners among you our neighbours at Peckham Rye and Wimbledon Common will both be hosting events at 9am, so you may wish to run at either event and then come to Tooting Common to complete a New Year's Day double with us. Enable Leisure and Culture will be hosting a Wandsworth Schools cross-country event on Wednesday 4 October on the northern part of Tooting Graveney Common. Registration and the start area will be on the corner of the Common where Dr Johnson Avenue meets Tooting Bec Road. Enable Leisure and Culture are looking for volunteers to assist with the smooth running of the event and ensure all the children have a positive experience of running. Roles that need covering include timekeeping, marshalling and course set up and close down. GET ACTIVE WANDSWORTH FESTIVAL – VOLUNTEERS NEEDED! Volunteer at Wandsworth biggest Sport and Physical Activity Festival on Saturday 15 July at King George's Park, Wandsworth. The family fun event attracts 7,000 people a year to try new activities, learn about their health and be entertained by local groups. We are looking for volunteers to support the event and help inspire local residents to Get Active in 2017. There are a wide variety of roles on offer that include set up and set down of the festival equipment, greeting all visitors and informing them of all the available activities on offer. As a volunteer at the Get Active Wandsworth Festival, you will be given the opportunity to gain new skills, meet new people, make a difference and get a great feeling of satisfaction. These rules are intended to keep every parkrunner safe. We don’t mind whether you’re fast or slow. We just want you all to come back smiling next week. • If you’re in any doubt, we recommend starting at the back until you’re accustomed to our busy start line. • If you’re not trying to beat your best time, starting at the back helps us avoid congestion. • Ask the people around you what time they’re aiming for. If it’s vastly different to your own goals, one of you is probably in the wrong place. • Give way to members of the public. Our reputation and continuing use of the park depends on it. • If you choose to wear headphones, please make sure you can hear what’s going on around you. • Your time is not as important as the safety of our runners. • Remember that not everyone has the same level of experience. • Give courteous notice if you wish, but don’t assume you’ve been heard or understood. • Don’t make a gap where there isn’t one. Slow down if you can’t get by. • If your parkrun time is >25 minutes, there’s a good chance you will be passed. • Don’t run more than two abreast. • Keep left where possible, so that runners can pass on the right. • If you’re finishing, stay on the right. • If you’ve got more laps to do, stay on the left. • Stay in order and keep moving until you’ve collected your token. • Don’t cross the finish line twice (if you go back to help a friend). • Congratulate the person you spoke to at the start on a great run.